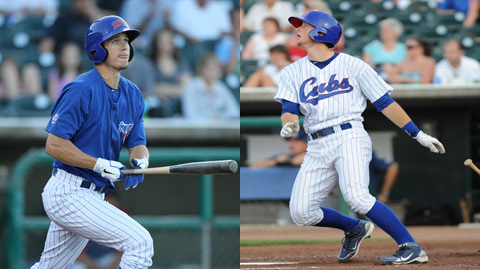 The Chicago Cubs announced on Thursday that they had traded OF Tyler Colvin and IF D.J. LeMahieu to the Colorado Rockies for 3B Ian Stewart and RHP Casey Weathers. Colvin, 26, had two stints with Iowa this season and batting .256 with seven home runs and 32 RBI in 50 games. He batted .150 with six home runs and 32 RBI in 80 games with Chicago. This past season was his first with Iowa after making the jump from double-A straight to the majors in 2009 and hitting .254 with 20 home runs and 56 RBI in 135 games with Chicago in 2010. The Cubs drafted Colvin in the first round (13th overall) in the 2006 draft out of Clemson University. LeMahieu, 23, began last season at double-A Tennessee and batted .358 with two home runs and 27 RBI in 50 games before making his Major League debut on May 30. He made his Iowa debut on June 28 and batted .286 with three home runs and 23 RBI in 58 games before going back to Chicago in September. He hit .250 with no homers and four RBI in 37 games overall with Chicago. Following the season, LeMahieu participated in the Arizona Fall League and batted .302 with two home runs and 21 RBI in 31 games for the Mesa Solar Sox. The Cubs drafted LeMahieu in the second round of the 2009 draft out of Louisiana State University. If Weathers doesn't make Chicago's major league roster out of spring training, he could be a candidate to pitch for Iowa in 2012. He was 2-2 with a 5.32 ERA in 44 games with double-A Tulsa last season.